SYDNEY – “Justice for All? The International Criminal Court” was the title of a conference earlier this week at the University of New South Wales in this Australian capital. ► The Court’s record on gender justice. 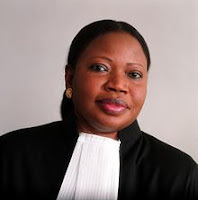 This post will focus on the very interesting comments provided by Prosecutor-Elect Bensouda, who spoke on a panel dedicated to examining the final theme. Completing this panel were two additional IntLawGrrls contributors – yours truly, Valerie Oosterveld, and Brigid Inder, Executive Director of the Women’s Initiatives for Gender Justice, a nongovernmental organization based at The Hague, Netherlands. Bensouda, who is also the Office of the Prosecutor’s (OTP) Focal Point on Gender Issues, outlined the gender-sensitive aspects of the Rome Statute, and described how these have been implemented by the OTP. She also explained how sexual violence was a specific instrument in each conflict under examination by the OTP. ► Pursue gender-based crimes set out in the Statute and give victims a voice. “By setting an example, we will transform the public response to sexual violence,” she said. ► Strengthen cooperation between the OTP and civil society groups, including the both Women’s Initiatives for Gender Justice and local groups in situation countries that provide the only form of support to women shunned by their communities. ► Periodically and consistently revisit the OTP’s policies on sexual and gender-based crimes to ensure that the OTP’s approach is effective and always improving. ► Look for innovative methods for the collection of evidence to ensure effective prosecution of these crimes. ► Finalize an OTP Gender Policy paper. It is already in an advanced stage of development. Bensouda said that she will open the draft paper for external comment, adding that she intends that this policy paper will provide transparency and predictability to the OTP’s work on sexual and gender-based crimes. These are very exciting plans. I, for one, look forward to seeing the draft policy paper and welcome these commitments.